How to Fix “Ffmpeg.exe has stopped working” Error on Windows? Home »	Fix » How to Fix “Ffmpeg.exe has stopped working” Error on Windows? Issue: How to Fix “Ffmpeg.exe has stopped working” Error on Windows? “Ffmpeg.exe has stopped working” pop-up on Firefox. I’ve been using the web browser for so long without any issues, but about a week ago it has started displaying this pop-up message. It shows up about every minute, several times one by one. Is it a virus? Does it indicate a system/browser error? Could you please help? Thanks in advance!!! 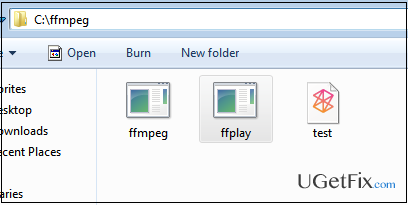 Click Start and type ffmpeg. Right-click on the file and select Open File Location. The file should be located in the folder of Mozilla Firefox. To stop “Ffmpeg.exe has stopped working” pop-up from appearing, move the Ffmpeg.exe file from it either to your desktop or another location. After that, reboot your PC. Open Mozilla Firefox, go to its menu (click on three bars in the top right corner of the window), find Add-ons, and select Extensions. Here try to find all browser extensions that you are not familiar with and that look suspicious. Click Remove next to extensions that you do not want to keep. It is very important to check whether this dubious adware hasn‘t replaced your default start page or search engine. For that, open Mozilla Firefox anew, go to Options and select General. If your homepage is Google, Bing, Yahoo or another that you have set by yourself, everything is OK. If, however, you see these default settings were changed without your permission, make sure that you reset the settings by clicking Restore to Default or entering your preferred Homepage URL. Open Google Chrome, click on three-bar button at the top right corner (Menu button) and go to Tools → Extensions. Remove suspicious websites by clicking on X next to them, and then enter an URL of the site that you would like to set as your homepage.